Replaces stock handlebar clamp with this robust billet aluminum clamp. Engineered to be stronger than OEM handlebar mount. Machined from a solid block of 6061 aluminum and laser etched with the EE logo on each cap. Stock bends EASY. This one much better !!! Nice and thick ! Great replacement for OEM bar clamps. These are made the way OEM should have been manufactured good quality and rugged design. Does this come with bushings and/or hardware to mount it to the top clamp? Thanks. BEST ANSWER: The clamp is made to reuse your stock bushings and bar mount bolts. The bolts that are supplied are to mount the top clamps to the bar mount. Hi! Could anyone tell me what's the height of the mount for 2016 - 2017 KTM 250 - 450 SXF? BEST ANSWER: the ride eng. bar mount is within a millimeter of the stock bar mount height. I haven't measured it. But its a little higher than stock. Will this work with the Enduro Engineering Risers installed? BEST ANSWER: Yes it will. Thank you for the interest in our products! Will these for on ktm 400 exc? Can this be turned around so bars can be adjusted forward or back? BEST ANSWER: Yes it can. The mount is offset slightly so you can position it either way. What diameter handlebars fit this clamp? 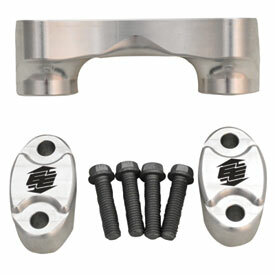 BEST ANSWER: These are designed for the stock KTM and Husqvarna handlebars which are 1-1/8".